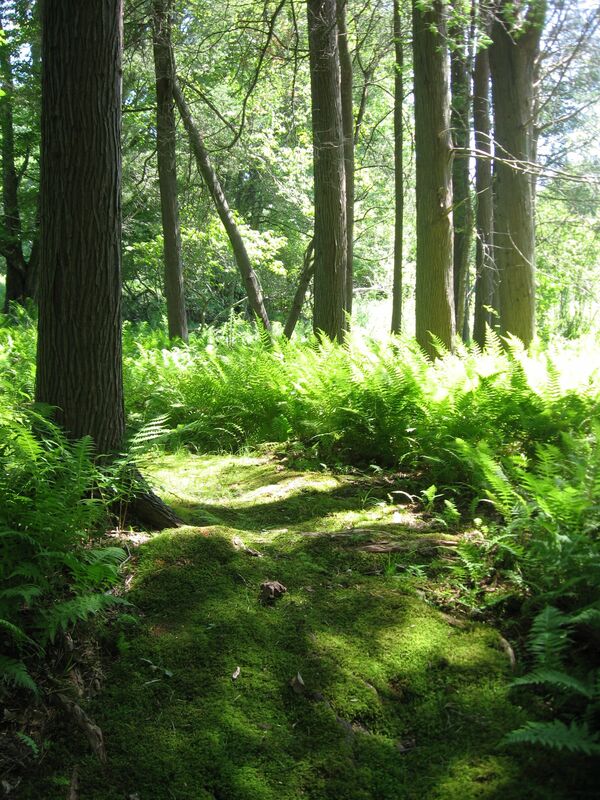 A New England forest in the summertime is full of ferns and the scent of Hay-scented fern. Oak and Chestnut trees, White pine, Skunk cabbage and Mountain Laurel thickets. 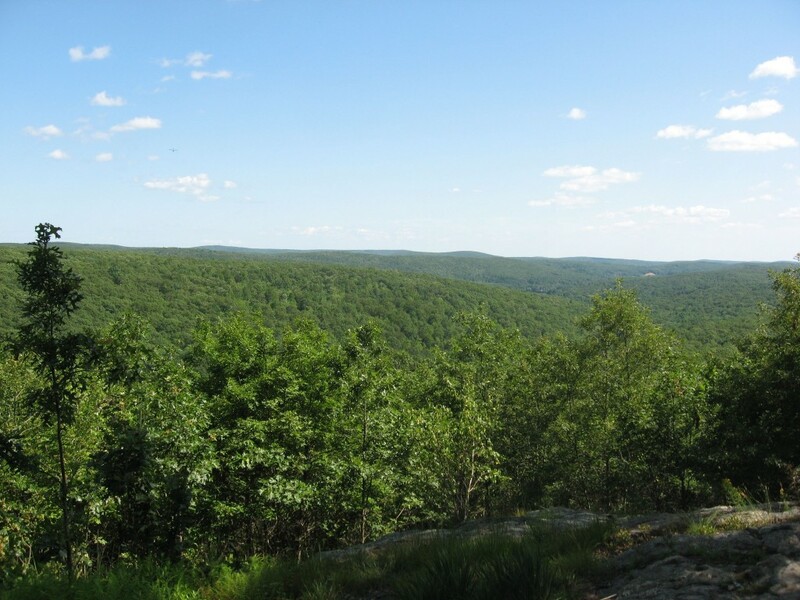 This is the childhood forest landscape of Sanguine Root Staff Writer Sean Solomon. The next door neighbor to the Solomon family’s forty acres of forest is the Norcross Wildlife Sanctuary, six-thousand acres of forest. Norcross has educated generations of school-children and their parents alike about the natural world right at their doorsteps. In the summer of 1987, Sean was employed by the sanctuary, a job that carries fond memories. This past July, we visited Norcross. 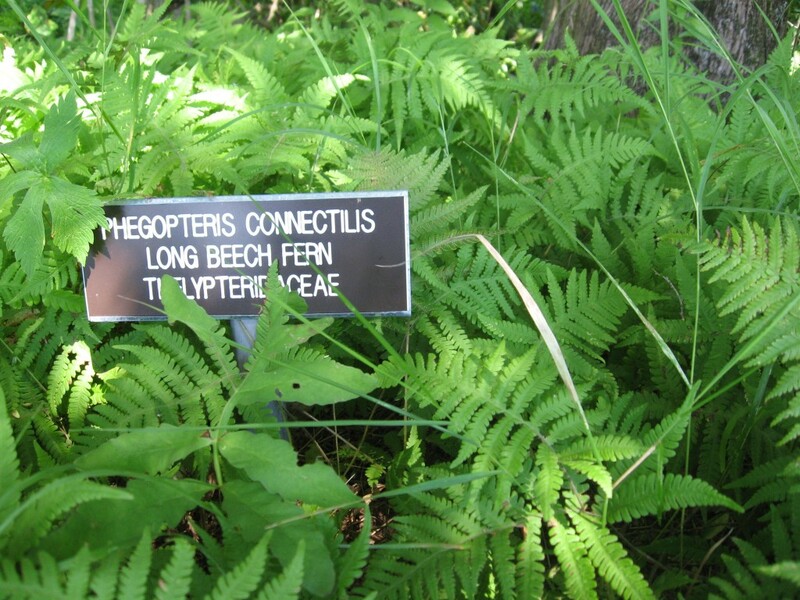 Norcross is The place to learn about the native ferns. Our host, Leslie Duthie, has a greenhouse on site where the propagation of ferns is ongoing. She brought us to the garden areas where native plants are grown and propagated. 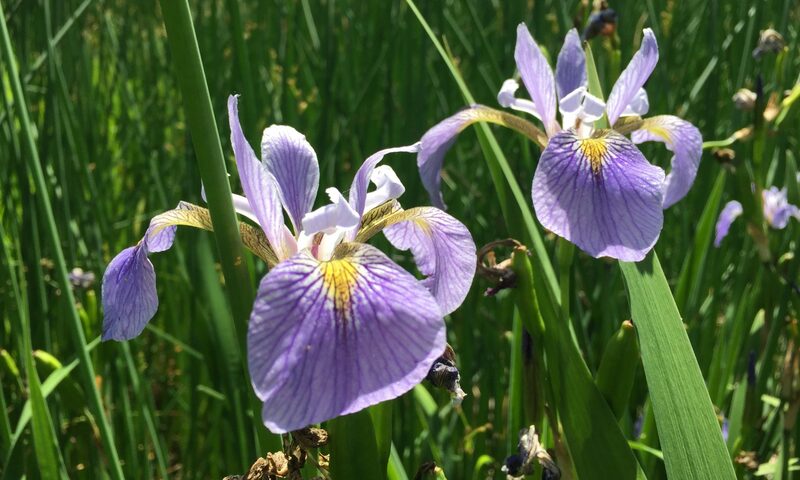 For us native plant enthusiasts, this place is amazing! It is a museum of native plants. Like the Louvre in Paris, this museum cannot be fully viewed in just one day. 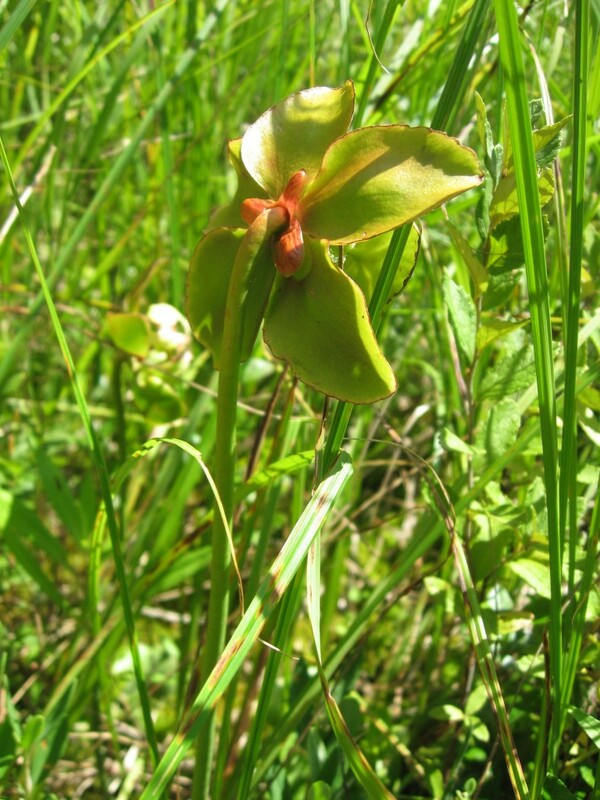 The pitcher plant first sends up a flower. After it is done flowering and being pollinated, the plant then sends up an insect-trapping structure. This part of the plant comes after the flower, which is pollinated by insects, because it would be a conflict of interest to consume the insects needed for pollination. Not a good idea to eat your pollinator! When the flower is done being pollinated, this structure is then put in place. Our studies of various species have highlighted regional variations, as well as variations within a population or region. The Mayapples pictured above are much taller than the ones that grow in and around Philadelphia. The leaves are smaller, however. Our hypothesis is that these New Englanders have adapted to greater snowfall and snow remaining longer even when they are ready to grow. 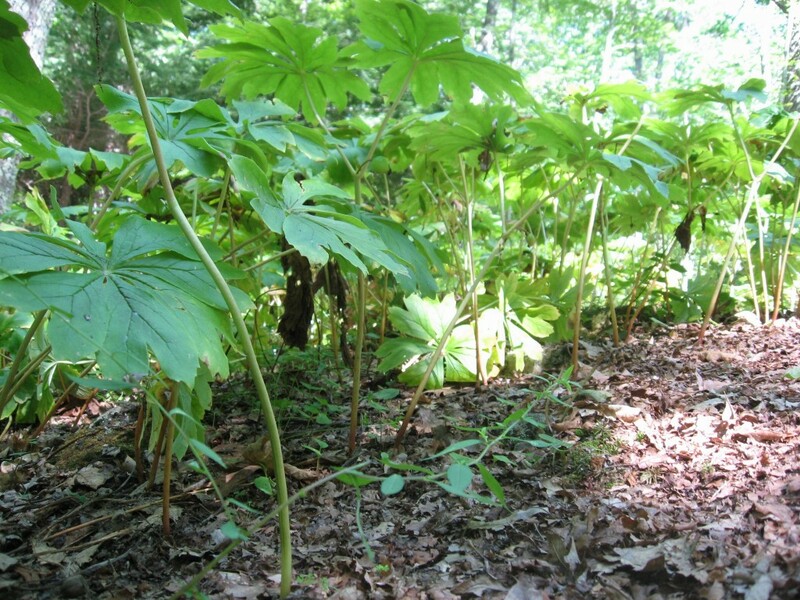 So over the thousands of years, the Mayapples with the tallest stems survived, and now New England Mayapples are taller. The added stem height means that the leaf size gets trimmed down. This year, our first and proudest Mayapple viewing was in Florida back in February, in an area where there are only a few populations of the species for the entire state. Finding this patch of Mayapples in Massachusetts at the end of July was a pleasant surprise. Here is a patch of Rhododendron maximum. This was a good point for a serious discussion about an ongoing problem in the sanctuary. 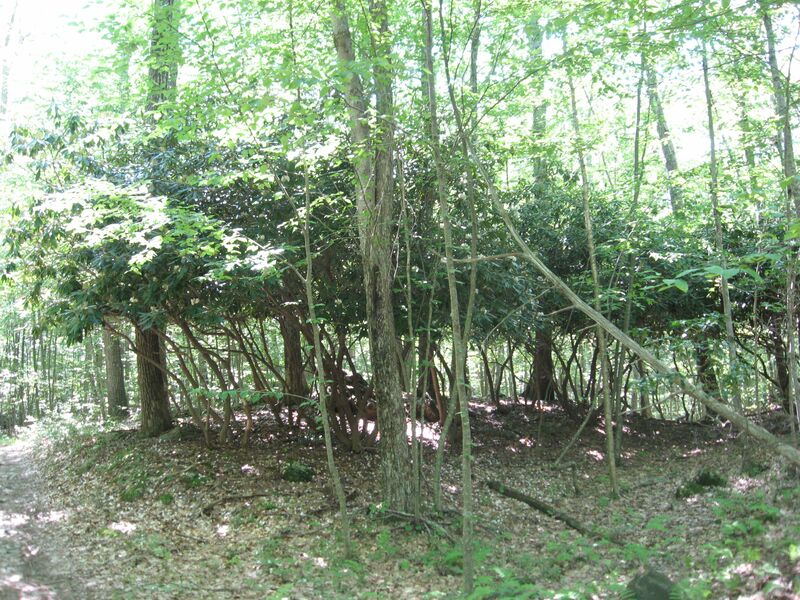 The greenery of the shrub stops at a distinct point, about 5 feet from the ground. Below this point there is very little green, except a few ferns. It was explained to us that this used to be a lush area, full of herbaceous plants. All along the ground were flowering trilliums that covered the hillside. There used to be seedlings and saplings of forest trees such as Oaks and Maples. As it turns out the distinct line of the Rhododendron is called the “browse-line”. Most plants below the browse line of White-tailed Deer are now extirpated from the area. Biologists visited the area and have estimated that this forest may never again recover from this imbalanced ecosystem. So many species of plants have been eliminated from the forest by the over-browsing of deer, that the area is now past the tipping-point of its prior state. 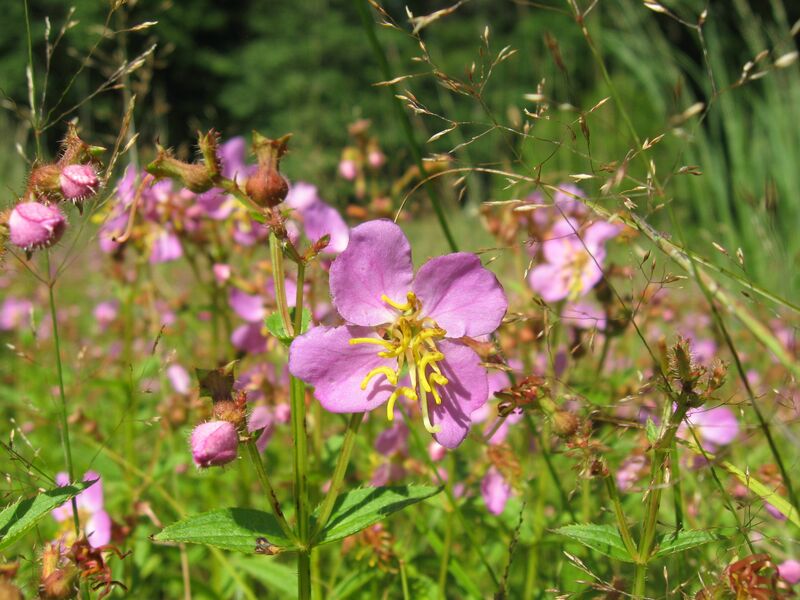 These plants played a vital role in the health and sustenance of the wildlife in the sanctuary by hosting species-specific native insects that were vital as a food source for birds and small mammals in the forest. This in turn is threatening the larger mammals, such as foxes, for example. 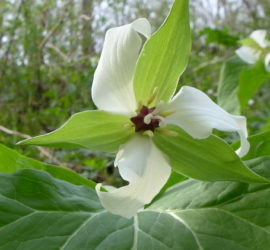 The remaining trilliums and associated wildflowers found in the area were removed in a last-minute effort to save them. 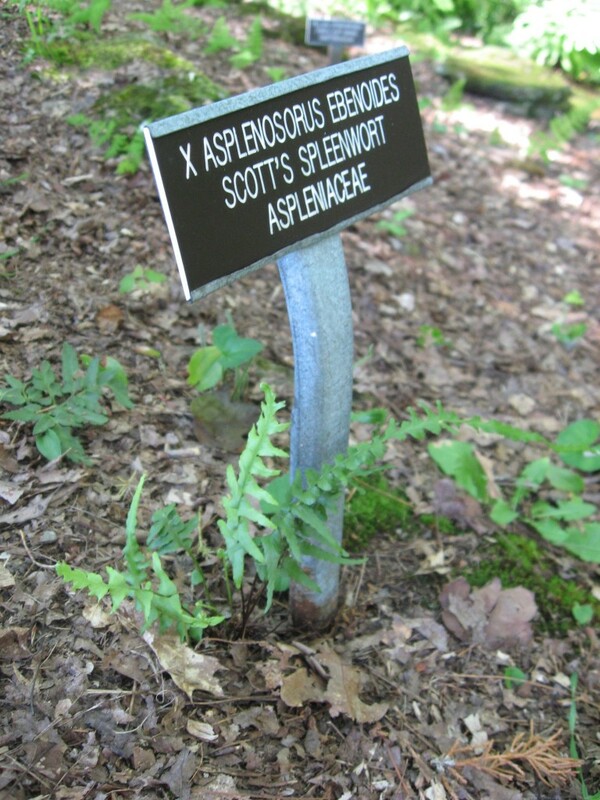 They are now growing in a fenced-in area near the greenhouse, where they can be sustained indefinitely. This is a crucial move, and if successful, will be what saves the local populations of these species and their unique genetic composition that is matched and married to just this very forest after thousands of years of evolution. The explosion of the population of the native white-tailed deer is a symptom of a disturbed ecosystem. A significant component of the ecosystem of healthy deer is the presence of the mountain lion which has been extirpated from many a forest. There was a time when the numbers of Deer were very low from over-hunting and habitat loss, and the Sanctuary served to protect them. 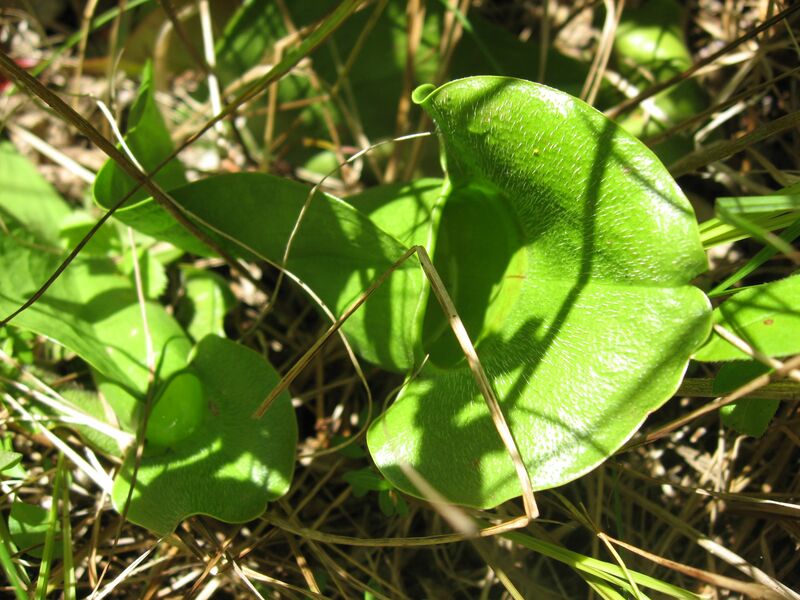 Even a native species can become invasive and destructive if there is enough of a break-down in ecological conditions. In many situations, individuals of this species suffer physically from hunger and malnutrition, conditions which are inhumane. As these conditions of desperation and suffering persist with the animal, whole colonies of plant species necessary for the survival of a forest are decimated. This is also called Meadow-beauty. Note the urn-shaped seed-pod. This is a stunning patch of very pretty native July and August blooming native wildflowers. Every saturday, the crew was instructed to inspect the roads in the sanctuary and to remove debris, fallen branches, etc. Inevitably this would involve an inspection of this look-out area. Just behind us, Leslie has been engaging work crews to help her remove Japanese Barberry, a problematic invasive in New England. This is that thorny shrub with red berries often seen on the islands of parking lots and gas stations built in the 1970s and 80s. This is just one part of the efforts to remove invasives from the Sanctuary. Asiatic bittersweet removal is also an ongoing operation here. What a great place to work, and Sanguine Root staffer Sean Solomon is a proud former employee!